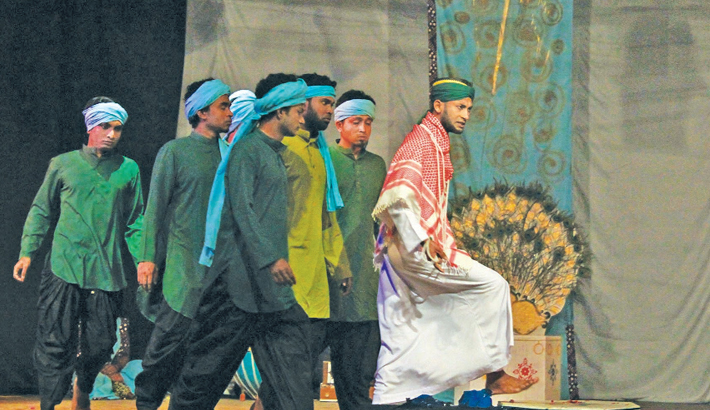 Students of the Department of Drama and Dramatics, Jahangirnagar University, staged `Nishimon Bisharjan’, written and directed by Anan Zaman, on February 4, 2018 as part of the 10-day-long inter-university theatre festival organized by Jahangirnagar Theatre marking its 38th anniversary at Selim Al Deen Muktamancho of Jahangirnagar University. The play, adapted from Tagore’s Bisharjan, speaks against religious extremism and contemporary happenings in society. In the name of God and religion, vested quarters take advantage of the faith and belief of the innocent people and make them commit inhuman acts like suicide bomb attacks. The play opens with a brutal scene of a child sacrifice in the name of Kali. Gobindamanikya, Tripura’s Monarch, on realizing the futility of blood sacrifices, issues a ban on these unnecessary slaughters at the altar of the goddess. Undoubtedly, this causes a general discontent in the state that is encouraged by high priest Raghupati, who thinks of himself supreme in the matter of religion. In between this conflict, Nishimon, a simple girl from the north of Bangladesh, loses her beloved Tarataj who is deviated into the path of an extremist group by the influence of a leader. In the name of Jihad, the leader encourages Tarataj to sacrifice his life. While taking part in a suicide bomb attack, Tarataj loses his life. As the story progresses, two events of two different times are seen to meet together. The festival was inaugurated on Sunday and it will come to an end on February 11, 2018.